glitters on car keys beside the back door. Need I reply to these? of dark hairs and round handle. Diane Lee Moomey grew up near the Great Lakes and, since then, has lived and wandered around the U.S. and Canada. These days, she dips her gardener’s hands in California dirt, and reads and listens regularly at poetry venues in the San Francisco Bay Area. Diane is the author of multiple books, has published in journals, and has even won a prize or two. Besides poetry, she enjoys long walks beside the ocean, reading mysteries, and painting in watercolors. 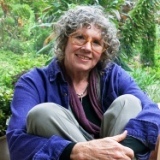 Learn more about Diane at https://www.pw.org/content/diane_moomey and www.dianeleemoomeyart.com. This makes me want to paint, and I'm not even a painter. Trusly a lovely poem about one womann's fine use of her talent. Yes, I agree, we all have some 'art' in our soul, hidden or displayed. It's all about light, isn't it?